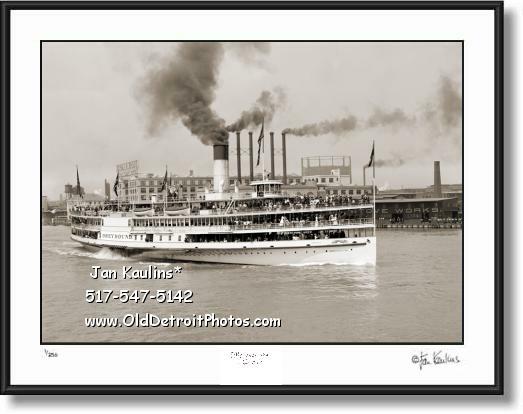 STEAMER GREYHOUND Detroit River Steamship 1905 picture photo print for sale. This sepia toned fine-art photo of THE STEAMER GREYHOUND is made from a professionally restored original negative/photo of this historic side wheeler Steamer Greyhound. In the background can be seen the industrial shoreline of Detroit at the turn of the century with a large sign visible of Morgan & Wright Detroit Rubber Works and a partial sign for the large Detroit Stove Works factory on The Detroit River. This is an excellent detailed image of this 3000 passenger Steamer that ran the Detroit to Toledo route shortly after being launched in 1902. It was one of the most luxurious vessels of that era and is shown here in profile in this beautiful photograph. On the bow of the ship can be sign written 'US Mail' and just above that a painting of a large Greyhound dog in stride. On board can be seen huge crowds of people in their fancy 1900's dress.